When the flickering flames in your fireplace are obscured by an oily film or thin veil of black soot, it can ruin the ambiance that a fire creates. Depending on the type of dust or soot, the glass can become etched from grime that is left on its glossy surface for too long. A good homemade fireplace glass cleaner can get this messy job done quickly. The cleaner you choose may depend on the type of fireplace you have. Even if your fire is created from a clean natural gas line at the bottom of the fireplace, the glass front will still need a good cleaning a few times a year. This will ensure that the buildup from household dust and soot doesn't get too thick. Once a layer of fine dust has been left on the glass under hot conditions, it can be difficult to remove. Twice a year, gently clean the ceramic logs and reposition them. If they have settled over the burner ports from the gas line, they can create soot buildup. The dampers and air controls need to be open when you have a roaring fire to keep soot from gathering around the mantle and glass doors. Make sure the wood that you use has been properly seasoned and the chimney is cleaned once a year. A fireplace glass cleaner shouldn't contain chemicals if you hope to keep a homemade wood stove free from toxins. 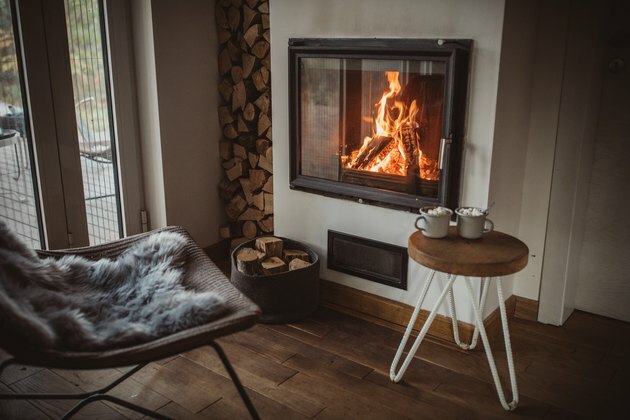 If the air-to-fuel ratio on a propane fireplace is incorrect, it can cause soot to build up quickly on the surrounding walls and glass of your unit. Check the fake logs that sit over the gas nozzles and make sure the nozzles aren't clogged or directly covered by the logs. Check the shutter or flue to make sure it is in the correct position. If the tank manufacturer uses butane, this can also create soot. Butane requires more oxygen to burn cleaner than propane. There are a few ways to tackle the messy job of removing soot from glass fireplace doors. Straight vinegar in a spray bottle won't hurt the glass and will ensure you spend as little time as possible getting gunk off the glass. Vinegar can create streaks on truly dirty glass, so be prepared with a pile of clean towels to take a few turns at scrubbing away the soot. You can also use the following recipe for glass that is covered in a layer of black grime. The added cornstarch makes it more abrasive and effective yet gentle enough that it won't mar the glass. If you still have patches of brown or black soot on the fireplace glass, then this formula should cut through those difficult dirt areas. Spray this on and leave it for a few minutes before removing it with a clean towel, using small circular motions. It can buff out minor scratches in the glass. It doesn't contain harmful chemicals. It is a mild abrasive. To clean the glass, rub the toothpaste in small circular motions on the glass with a soft towel. Leave it there for 15 minutes or so and gently rub it off. Rinse the toothpaste with water and give the glass a once over with glass cleaner. Don't use gel toothpaste. This will just create a haze on the glass and make a bigger mess for you to clean up. Why Is My Fireplace Glass Turning Black?